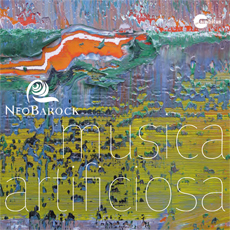 The new CD musica artificiosa by NeoBarock, ECHO Klassik award winner, is not a baroque album for quiet time by the fireplace. NeoBarock coaxes tunes from the tremendously divine pieces by Biber and Schmelzer, or the almost forgotten Johann Baal, that will knock your socks off. In this album, NeoBarock unifies the entire world of baroque: abundance and exaggeration, illusion and reality as well as diseases and war – highly up-to-date and thrillingly performed “without a single bar of boredom” (Schaffhauser News, Switzerland). The design of the cover was taken on by Gerhard Richter, turning it into an acoustic-visual artwork, including a booklet that (in contrast to a download) invites to flipping pages and browsing.